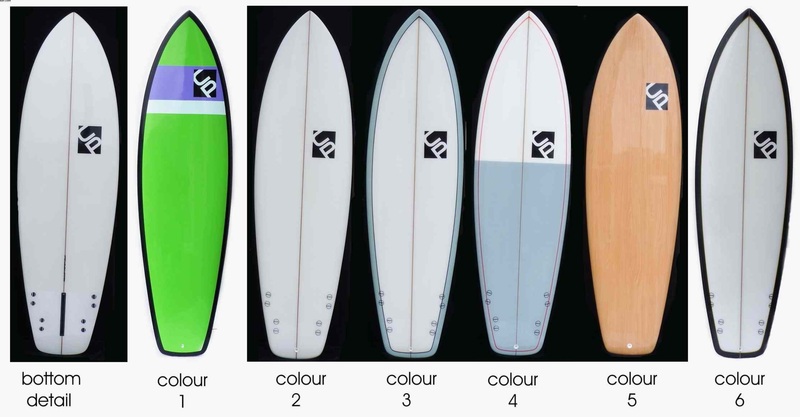 A new "lower profile" version of our popular "retro fish", available in sizes 6'0", 6'2", 6'4", 6,6", 6'8", 6'10", 7'0", 7'2", 7'4". Still with a big volume and planing area but with a wide squash tail and lower rail and slightly narrower , allowing a little more performance and consequentialy a little less stability. We have made this with a quad fin plus 10" finbox, allowing the rider to experiment with many fin configurations and adjustments. This board just oozes FUN !! Top tip.... Using an 8" fin, ride it as a single fin in smaller surf. This board comes standard as a quad fin. Colours 1 and 5 are made with epoxy resin and styrofoam core and are fitted with the future fin system. 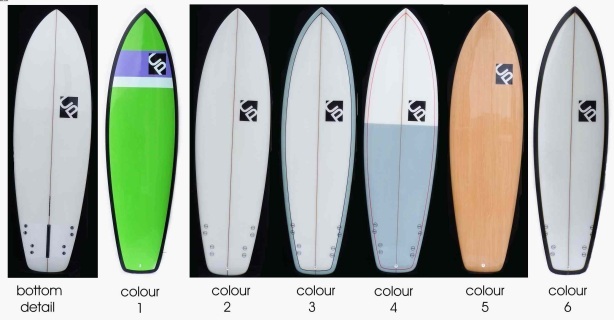 Colours 2,3,4 and 6 are made with polyester resin and polyurethane foam (the traditional way and come fitted with the FCS fin system. Click on view product for size and colour options.